Tania Rosario-Méndez, will lead an artistic residency centering on memory and remembering, Círculo de Memoria, at the Luis Muñoz Marín Foundation (enrollment still open). The residency will begin with the screening of her documentary Entrando al Círculo de Memoria [Entering the Circle of Memory] on Sunday March 29, 2015, at 3:00pm. Project: There is a place where to remember becomes food for the soul and healing for the country; that place is called Círculo de Memoria [Circle of Memory]. For the past 13 years, this project has been dedicated to rescuing the memories of generations of Puerto Ricans over 60 years of age and to promote the preservation of this heritage through video recording and the publication of books and magazines. Círculo de Memoria is a temporary community for the exchange of knowledge, a space for intergenerational dialogue, a type of “”utopia come true,” says its founder and director, artist Tania Rosario-Méndez, who will lead an artistic residency at the Luis Muñoz Marín Foundation, in which there is still room for new enrollment. 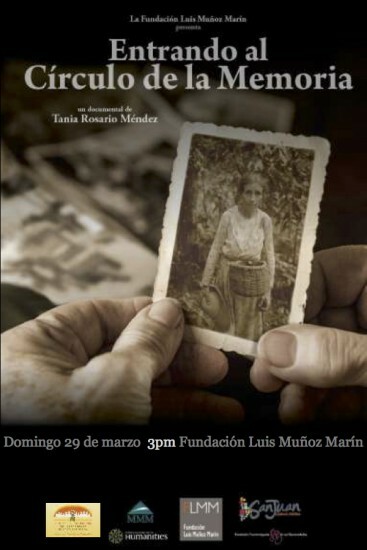 Screening: The project begins on Sunday March 29, 2015, at 3:00pm with the presentation of the documentary Entrando al Círculo de la Memoria [Entering the Circle of Memory] in the multi-use hall at the Luis Muñoz Marín Foundation. This documentary tells the life stories of a group of people born in the 1930s. Through their testimony we can feel how this generation lived, and in a way were protagonists in the dramatic transformation Puerto Rico underwent during those years. The screening will end with a discussion between the audience and the film’s production team, including director Tania Rosario-Méndez. People over 60 years of age who are interested in taking part in the next Círculo de Memoria (starting on April 7) may enroll at the event. Intereso unir algo de mis esfuerzos y recursos a este interesante proyecto. Creo tener material útil para abundar sobre la historia de nuestra gente humilde, de aquellas generaciones que lulcharon con denuedo para ser lo que somos hoy día.